Until about 1050 Lambeth was one manor, but at about this time it was divided into three, of which the central part, Kennington, was granted by the King to one of his servants, Theodoric the Goldsmith, by whom it was held for about forty years. After many changes of ownership the manor eventually returned to Edward III who granted it to his eldest son – Edward of Woodstock or ‘The Black Prince‘ as he later became known – as part of his estates as Duke of Cornwall, and the manor is of course still part of the Duchy estates. The building records of the time indicate clearly that the Black Prince was building at Kennington from the early 1340s until about 1350 and that during this period he built a Hall, a Prince’s chamber, and other chambers. Between 1353 and 1363 a new Hall was built with a chamber and wardrobe, a kitchen, bake house and pastry cook’s house, and some of the earlier buildings including the original Hall were demolished, though part of the first structure seems to have survived and to have been incorporated in the rebuilt Hall. At the end of this second phase of building the Palace consisted of a large Hall orientated east-west and measuring approximately 88 feet long by 53 feet wide: this was built entirely of stone with an undercroft sunk about 2 feet 6 inches below ground level with a chalk floor and stone-vaulted roof supporting the floor of the main Hall which was about 6 feet above ground level. At the east end of the Hall was a massive structure two or three storeys high and about 87 feet long by 34 feet wide. This was the ‘Prince’s Chamber’ mentioned in the records, and in the angle between the two buildings was a small square structure interpreted as an enclosed stair and garderobe or latrine. To the west of the main Hall was a smaller building which served as a kitchen. There is considerable. 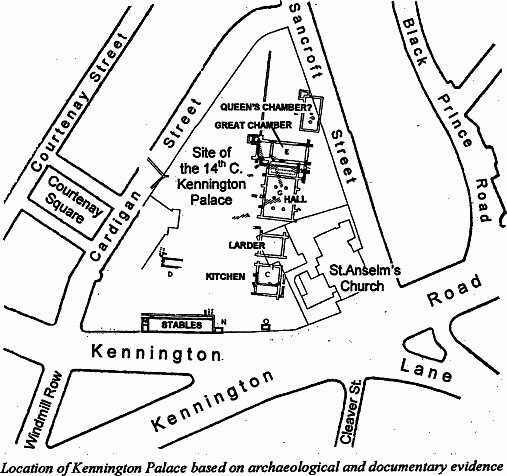 evidence from contemporary writings that Kennington was used as a royal residence and as an occasional place of refuge for the King away from London politics. In 1531 the greater part of the Palace was demolished by Henry VIII to provide materials for his own Palace at Whitehall.